Vegan lasagne served at the Ovolo, Woolloomooloo. The bright and colourful Ovolo Woolloomooloo just got so much more compelling with the opening of Alibi, a naughty and nice combo of glamorous cocktails and a healthy and fresh plant-based menu conceived by chef, restaurateur and global plant-based dining pioneer, Matthew Kenney. 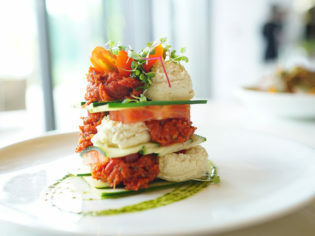 The menu uses innovative cooking techniques to give locally sourced plant-based ingredients a mod makeover, with smoking, fermentation and molecular processes all featuring. Is plant-based the new term for vegetarian – can you explain the menu concept? Plant-based is a term used to describe a diet that solely focuses on plant-based foods and makes plants the star. We prefer to use ‘plant-based’ as there seems to be a taboo around the term vegan and how narrow-minded that term can be. What is the benefit of a menu like this? Years ago a friend took me to a raw food restaurant that was the light-bulb moment that drew my focus firmly to the benefits of raw and plant-based food. The place was full of healthy, glowing people and after my meal I felt amazing. That meal set me on the path to a 100 per cent plant-based diet and career. At Alibi, we recognise the wellness trend and customers wanting to embrace wellness, and the demand for a clean lifestyle and plant-based foods, so here we are. How do you approach constructing a plant-based menu without it falling into old vegetarian clichés? I am a classically French-trained chef, so my team and I apply classical and innovative techniques to give locally sourced, plant-based ingredients a creative makeover. Smoking, fermentation and modernist tools all apply. Luckily our food is what everyone likes to eat now! There are so many but I love the spicy udon. It’s really rich and creamy and I love the spice element. Organic udon noodles are tossed in a rich cashew hoisin sauce made from cashews, tamari soy, black garlic, sesame, chilli and black pepper. What feedback have you been receiving from diners? People are loving the option of having a plant-based menu at nighttime. There are few venues that offer this in Sydney in such exciting surrounds and with cocktails. And your go-to cocktail from the Alibi menu? Probably the Ananas as it reminds me of the Sydney sunshine. It’s a combination of rum, citrus, ginger and cold-pressed pineapple juice.